There's no doubt that fruit smoothies are profitable menu items. Make sure to enhance your bar, coffee shop, or cafe's drink menu with a variety of flavorful smoothies, including a top-selling pina colada-flavored smoothie made from this Torani 64 oz. mix! This mix delivers a refreshing blend of pineapple and coconut flavors and vivid yellow color, while its large capacity means you'll be able to satisfy dozens of customers before needing a replacement. The 64 oz. container also features a large handle that makes pouring easy and a resealable cap that's great for keeping unused product fresh. Save time and costs from buying smoothie ingredients and lessen kitchen preparation time with this premade mix that's made with real fruit, no artificial colors, and no artificial flavors. Simply pour over ice and blend - it's that easy! Torani pina colada smoothie mix has the pina colada flavor I like and was looking for. Mixes well with alcohol to make a delicious cocktail. I was selling smoothies at a cultural event in which many attendees were more into natural products. After I explained the type of smoothie mix that I was using and showed that it was ALL NATURAL, customers started to purchase my smoothies. I am very pleased with my purchase and it tastes natural too. I will be reordering for my next event. 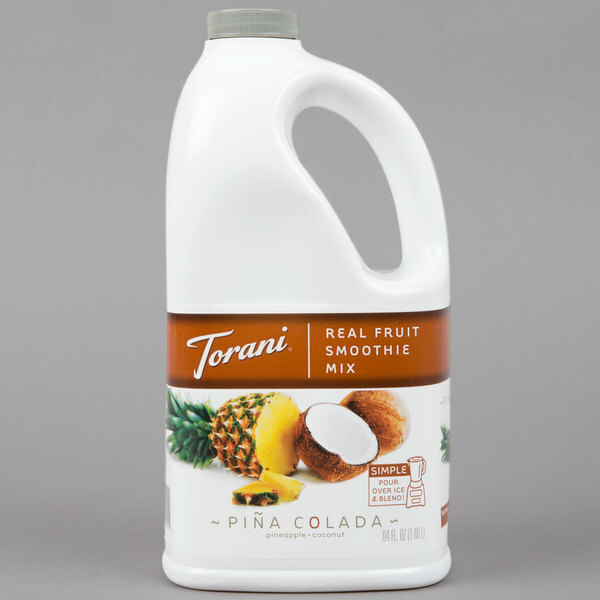 A top quality pina colada smoothie mix from Torani that is two thumbs up on taste. The mix is a great thickness and quickly blends into smooth drinks. Great for cocktails and icees too. these are good, Not my favorite flavor only cause I don't like pineapple, but others seem to like it, great addition to the other flavors we were limited to purchase local. 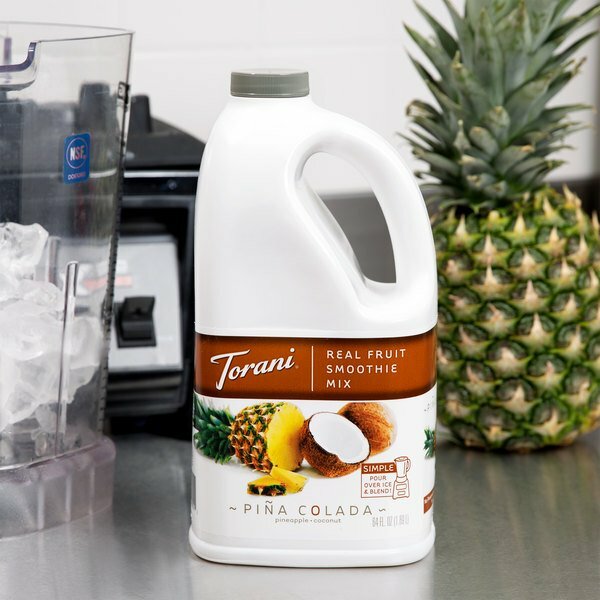 Huge fan of all things Torani and this pina colada mix is no exception. Great quality and makes a thick and creamy coconut cream daiquiri. We adore these mixes! We actually use them as our smoothie base, and then add real fruit to the mix. It adds the right amount of sweetness to a mostly real fruit smoothie! A really good pina colada fruit smoothie mix that is excellent for making bar drinks. The mix is creamy and thick and makes the best pina colada around. We love serving this delightful smoothie flavor at our pool bar. The pina colada is very popular and guests love the rich flavor and great texture of this mix. We introduced smoothies at our coffee shop last summer and this pina colada flavor quickly became a customer favorite. It smells and taste really good. We really like all of the Torani smoothie mixes but we don't like this one quite as much as the others. It's still good, just not our favorite flavor. It is a very convenient mix though for making all of your smoothies. A smooth and tropical tasting smoothie mix that is a big hit at our tiki hut. The flavor is wonderful and is so good served frozen. A fabulous mix. We’ve used all of the Torani Smoothie mixes but had a problem with this one looking moldy right when we opened it. It wasn’t expired but we had to dump it out. We appreciate your feedback! We’re sorry this did not arrive fresh. A Customer Solutions Representative will be contacting you directly. What a great taste, product has a clear flavorful taste. Mix is a little thick and on the yellow side but the flavor is top notch. This makes a wonderful smoothie. I often make smoothie bowls for breakfast and use this as a base then top it with frozen pineapple, coconut shavings and granola. It's awesome. We love making smoothies and trying different flavor. This Pina Colada fruit mix is great. Love the big 64 oz bottle that will last us a long time. This has a good taste. It's very tropical. It takes you mentally away to that island vacation. It's great as a slushie and can be garnished with pineapple and coconut pieces. Very good flavor, pineapple and coconut just as a pina colada should taste like. And it makes the best consistency for a smoothie!! I love Torani, smoothies!!!!! We offer smoothies to our customer and I chose Webstuaunt as my main supplier. The pina coloda smoothie mix will send your taste buds on vacation. I really liked this smoothie mix. Great for someone who doesnt want to make their own from scratch. It was really convenient... Taste just like pina collada! We bought this for a wedding reception they wanted non alcoholic drinks with a great taste. We were able to make a 3 gallon bowl with this that everyone raved about. Great product great price. So perfect for a quick summer cocktail ! I love adding rum to this ! It tastes exactly like the ones you get at those tropical swim up bars! I love Pina Coladas but this flavor was off and a huge disappointment for me. The seal was broken and the bottle did leak during shipment. I don't know if that affected the flavor or not. I really didn't taste pineapple/coconut. I hated to throw out such a large bottle of smoothie mix. Thank you for your review! We are sorry to hear that the bottle leaked during shipment. A replacement has been sent at no cost to you. This is a great product for the price, but just use caution. This product is super sweet. I usually mix it with a strawberry smoothie mix to dull it down.